In The Org, Ray Fisman and Tim Sullivan explain the tradeoffs that every organization faces, arguing that this everyday dysfunction is actually inherent to the very nature of orgs. The Org diagnoses the root causes of that malfunction, beginning with the economic logic of why organizations exist in the first place, then working its way up through the org's structure from the lowly cubicle to the CEO's office. Bureaucracy that hampers productivity, outrageous salaries for those at the top, cutthroat office politics, endless meetings that everyone knows are useless — there must be a better way to get things done than through today’s dysfunctional organizations. Isn’t there? The short answer, from Columbia Business School professor Ray Fisman and his co-author, Harvard Business Review Press editorial director Tim Sullivan, is: there isn’t. 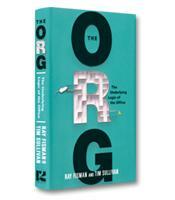 Of course not all organizations are perfectly designed and managed — no doubt, there is always room for improvement — but as Fisman and Sullivan demonstrate in their book The Org: The Underlying Logic of the Office, today’s organization is still the structural unit for our world. Yes, too much time is spent in meetings, and the politics of the workplace will always create roadblocks to success. But for Fisman and Sullivan, much of the frustration and concern that our organizations inspire are the result of give-and-take that is not only inherent but unavoidable in our economic system. Through scores of in-depth case studies of organizations ranging from the Baltimore Police Department to the island nation of Samoa, the authors explain why organizations are structured and managed as they are — in other words, the "underlying logic" to it all. How Much Can the Org Do? For instance, take the task of structuring the job so that employees are incentivized to be highly productive. Police departments, for example, might incentivize police officers by rewarding them based on number of arrests. Theoretically, this might seem logical, but on closer examination a number of issues arise. First, is it truly better to arrest 10 loiterers, or even car thieves, as opposed to one murderer? Even more complex is the fact that the job of a police department is not to make arrests but to keep the city safe. Thus the measure of "success" a police department uses for its officers actually reflects a failure of the department’s mandate. Even more important, the chosen incentive in this case might actually discourage officers from doing their job — keeping the city safe — because the initiatives and work that could help to keep the city safe is not rewarded. This is a very real problem, as the authors found in Baltimore. The answer is that the "org" — as the authors call it — can plan, structure and impose only so much. At some point, the police officers themselves must recognize the job they have to do and must act accordingly. And this is exactly what happens, the authors write. After a period of "cowboy" policing — making lots of showy arrests — many cops settle into a routine of keeping the peace in which arrests are the means and not the end. The bottom line is that structuring organizations based on high-powered incentives and rational economic principles might seem logical, but real life is different. The best organizations balance incentives with an acknowledgment of intrinsic motivation, which itself can be as high powered as any carrot — just ask any entrepreneur. Organizations do fail, and fail through their own fault. The subprime mortgage meltdown resulted from incentives that pushed loan officers to approve as many loans as possible, regardless of the risk of those loans. The problem, as the authors explain, is that these mortgage companies and banks did not have the guardians watching over the stars. Any organization needs to have stars swinging for the fences — but those stars are not going to worry about the risks; thus, the same organization needs to have guardians to ensure the quality of the quantity being brought in by the stars. The banks had no guardians ensuring the quality of the loans being approved, which was a recipe for disaster. The subprime mortgage experience explains, write the authors, "why we’ll always have oppressive bureaucrats, and free-thinking entrepreneurs oppressed by them. And that’s okay." The simple phrase "that’s okay" is the beating heart of this lucid, well-researched book. The organizations that we deal with — and their policies, structures and rules — will no doubt continue to frustrate us, but the fact is that despite the give-and-take, compromises and seeming unfairness, today’s organization is still the best vehicle to get things done. Organizations may not be perfect, but that’s okay.